Second primary tumors constitute a major problem in patients with squamous cell cancer of the head and neck. They occur in 15%–30% of cases, mainly in the upper aerodigestive tract (Gluckman et al. 1980; Hordijk and de Jong 1983; de Vries 1990). The majority of second primary tumors occur more than half a year after the index tumor and are called “metachronous”; when they occur within 6 months, they are called “synchronous.” They occur more often in men than in women and usually have a bad prognosis, because they often occur at bad sites (lung/esophagus) or in already treated areas, rendering curative treatment difficult or impossible. In certain early stage diseases such as T1 NO laryngeal cancer, the risk of death from a later lung cancer is greater than from the primary disease. 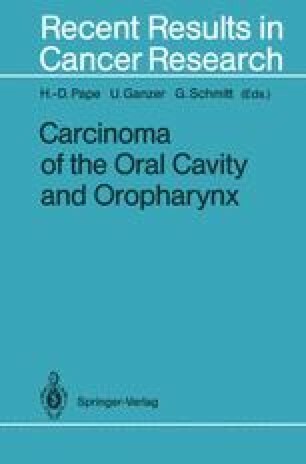 For this reason, second primary tumors are regarded as the “overshadowing treat” for early stage head and neck cancer patients (Lippman and Hong 1989). Second tumors are one of the main reasons that despite many advances in the treatment of head and neck cancer (e. g., in reconstructive surgery or combined treatment modalities), long-term survival has only marginally increased in the past decades. Interest in the phenomenon has increased, and during the last 10 years, much has become known about their etiology, pathogenesis, frequency, and predilection sites. Research on the value of screening and (chemo)prevention has taken place and is still in progress.